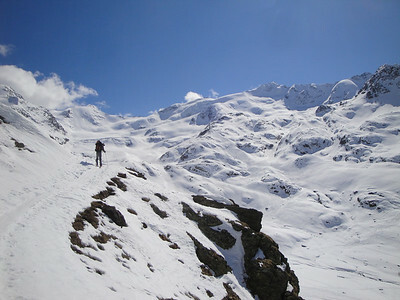 This was a personal ski trip to the Ortler area in the South Tirol in Italy. 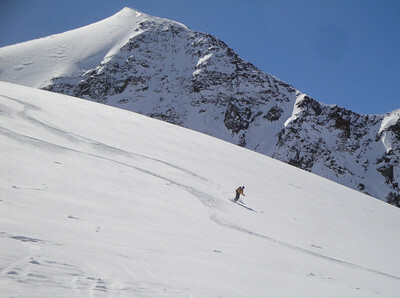 The Ortler ski tour is different than many of the other ski tours in The Alps in that it is a big loop trip that allows for multiple layover days and the emphasis is on finding great turns in stunning terrain rather than getting from point A to point B as fast as possible. 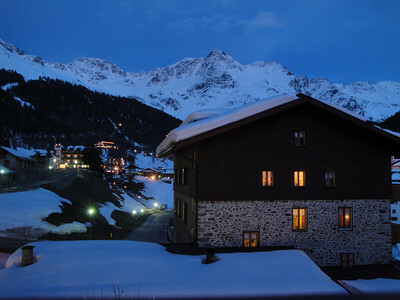 This quickly became my favorite European Alps ski tour and one that I plan to offer as a guided trip in the years to come The mountain huts are truly amazing and more like hotels with private rooms, hot showers and delicious Italian food and wine. 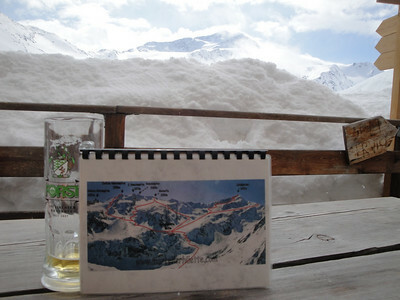 We spent 2 days skiing off piste at Sulden, where we began the tour, and then spent 7 days on the tour. 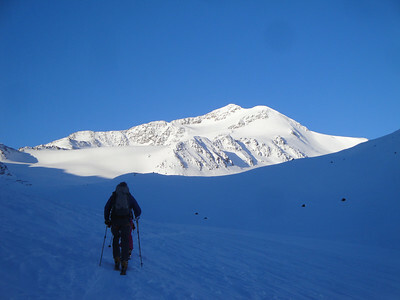 We spent one night at the Marteller Hut, 3 nights at the Brenva Hut and 2 nights at the Pizzini Hut. 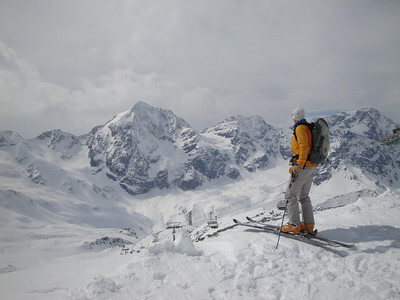 We culminated the tour with a spectacular summit and ski descent of the famous Gran Zebru (Konigspitze) back to Sulden. Snow coverage was great and ski conditions were good to very good. Joining me were friends Rick Ziegler from Bishop, CA. and Gregor Finke and Erica Olsen from Reno, NV. 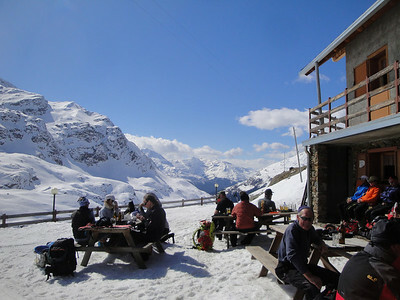 Amazingly, we had 8 days straight of blue bird weather (rare in the Alps) which allowed us to ski every day. 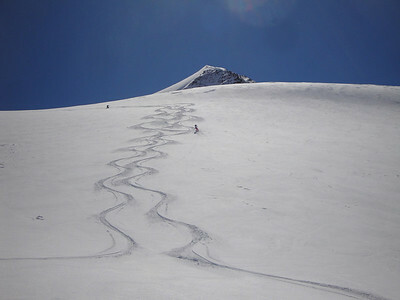 We found it all from spring corn to cold high altitude powder. 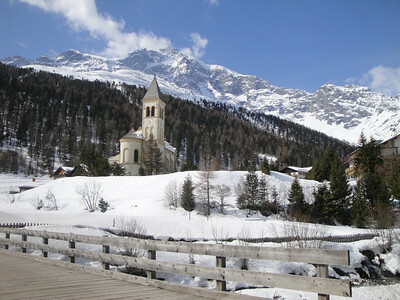 Our starting point, the small alpine ski town of Sulden/Solda, Italy. Even though this is technically Italy, the culture and the language is German/Austrian. Prior to WWI, this region was in Austria. Now it is a semi-autonomous region within Italy. Most people speak German but all the place names are in both languages. 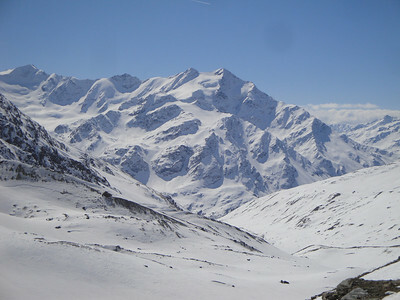 Another view of Sulden with the Ortler in the background. 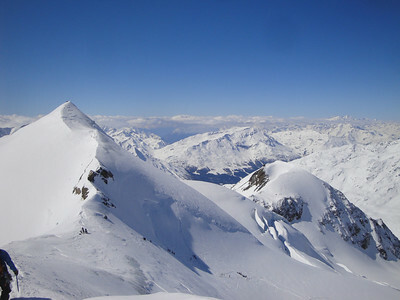 The Ortler is the highest peak in the region. Here's a view from the top of Sulden's ski lifts looking towards the Gran Zebru or Konigsptize - a steep and much sought after ski mountaineering objective. 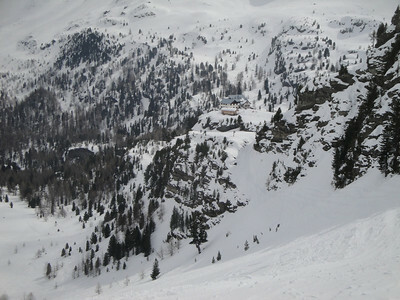 Carefully skiing down a steep couloir on one of the many good off-piste runs out of Sulden. 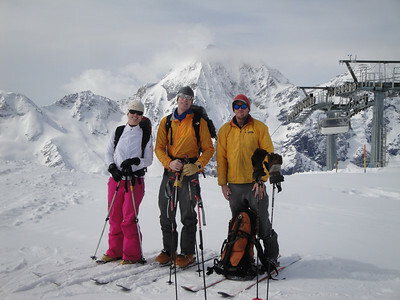 Erica, Gregor and Rick as we leave the lifts and begin our 7 day tour. 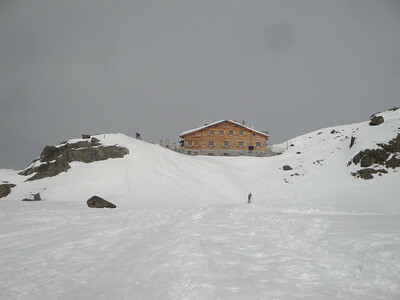 Arriving at the clean and comfortable Marteller Hut, our destination for the first night. 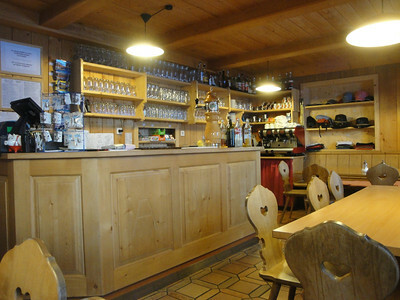 The bar at the Marteller hut. It is run by Peter and Willi, who seem to stay up all night with their hut chores. Skinning up the glacier from the Marteller hut on day 2 towards our first big objective, Cevedale - one of the classic ski peaks in the area. 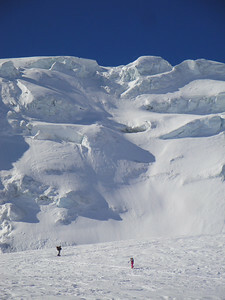 The view of the summit of Cevedale from Cevedale II. 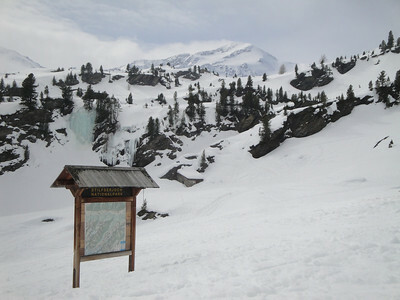 As we turn the corner on or way to the Brenva Hut we get a glimpse of the ski terrain that awaits us for the next three days. And this view less than half of it! 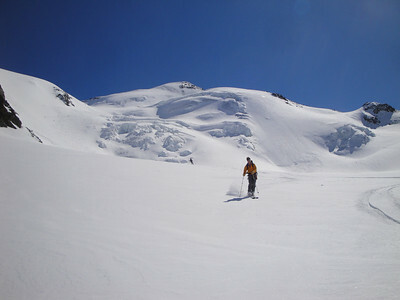 Skinning up the glacier towards the summit of San Mateo on day 3. 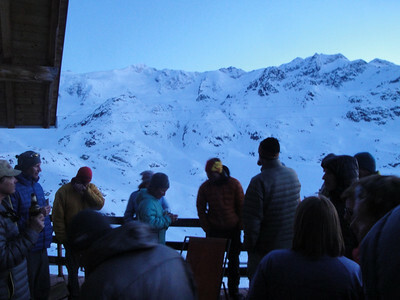 An impromptu deck party with another American guided group led by IFMGA guide Adam George and assistant guided by Mike Hattrup.